​Over their fifty years of combined experience in parish ministry Rob and Janne have encountered a wide variety of challenges and opportunities. 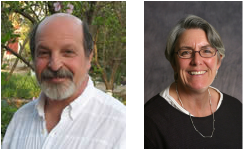 Currently co-ministers of Unity Church-Unitarian, they have extensive experience in congregational life, organization development and capital fundraising. Laura is an organization development consultant who helps congregations know their purpose, the difference they make in people's lives, and then helps them organize to deliver on that promise. An expert facilitator, Laura is the author of The Nested Bowls: The Promise and Practice of Good Governance. Laura is a past member of the church’s Board of Trustees and Unity Consulting's Managing Director. Roger completed a nearly twenty-five year ministry at the Fox Valley Unitarian Universalist Fellowship in Appleton, WI. During his tenure as the congregation’s first settled minister and then its first Senior Minister, the congregation's membership has grown from 100 to nearly 700 members, making it one of the twenty largest Unitarian Universalist congregations in the United States. In 2006, the Fellowship transitioned to a policy-based governance system largely modeled on that of Unity Church-Unitarian in St. Paul. The governance change went extremely well and without it, Roger does not believe his congregation would have been able to continuing growing. Roger believes that governance is an important tool for fulfilling a congregation's mission. Roger is currently the Executive Director of the Unitarian Universalist Partner Church Council. Bill’s interest in helping churches design tools of accountability to mission stems from his more than 40 years of marketing research design and analysis experience, including over twenty years at General Mills and twelve years at Research International, specializing in brand health measurement and optimization. He has published several articles in these areas including “Loyalty Leverage” in the Fall, 2005 issue of Marketing Research—winner of the Hardin award as best paper of the year. As Executive Director of Unity Church–Unitarian Barbara serves as controller, personnel director and facilities manager. Barbara has also managed health care non-profits and food cooperatives. Her “real world” experience brings a best practices perspective which churches sorely need. Joe is District Executive of the Unitarian Universalist Association's Northern New England District. As a consultant, Joe focuses on congregational vitality through renewal work on governance areas of covenant, mission, vision, planning and board development.